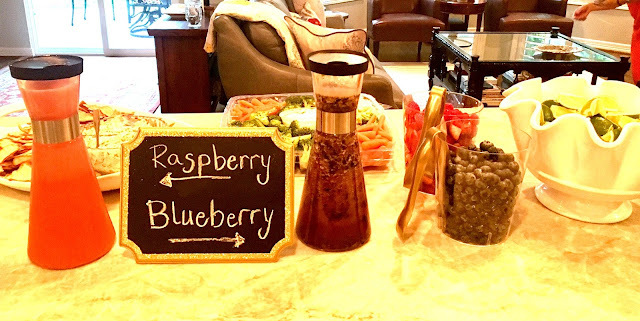 Mommas & Mimosas: Throw Together an EASY Cocktail Party for 25 in Less than 3 hours. No Pinterest Required! 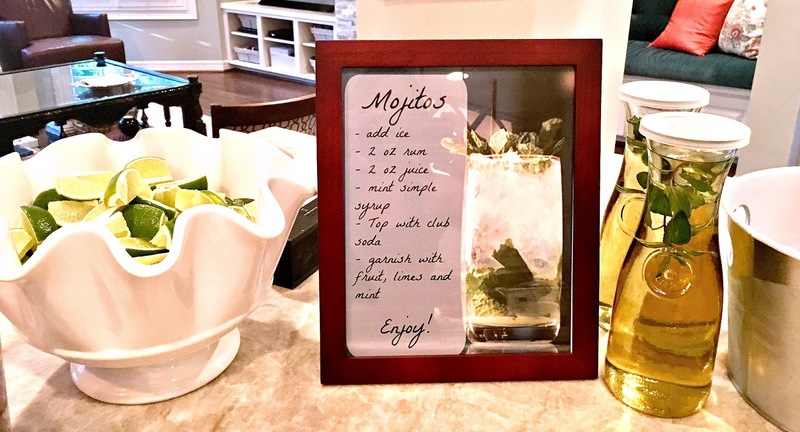 Throw Together an EASY Cocktail Party for 25 in Less than 3 hours. No Pinterest Required! Monica, I and another friend threw our first Mommas and Mimosas (and Mojitos) event as an auction item to raise money for our kids’ school. The whole idea of a party, at my house no less, is a little terrifying for me. I mean, first of all there is all those people to make small talk with (not one of my strengths), then getting everything ready?? I’m not creative, nor am I crafty or a decorator. When I do entertain, it is “Come over we’ll have margaritas," and it’s a couple of people that I know (well). Add to that the pressure of knowing that people paid for it….well hyperventilation started kicking in. I turned to Pinterest to look for easy ideas I could implement. What a mistake!! Pinterest is full of totally elegant ideas with the word “Easy” splashed over it to get me to click on it, but when I actually try to execute said “easy” idea, I come up a miserable failure, if I get past the 100 "easy" steps required to pull it off. As the deadline approached, I knew wallowing in self-pity had to stop, and we needed to get serious, so I used the Pinterest pictures for inspiration, but “dumbed” things down considerably for me to actually be able to do anything close to resembling the picture. So here is what we did, products we used, and things I would change if I had it all to do again. This was a party for about 25 people. The first thing I would recommend in hosting a largish get-to-together is find a couple of people to help you that off set your weaknesses. Here is a secret….People love to help, especially if it is with other people. I know I can organize, make lists, buy stuff, follow simple directions. Where I need help is someone telling me what looks good (No, Gretchen, step away from the Flamingos with the gold Elvis Sunglasses), and I need someone (or someones) at the party to talk to others and make them feel comfortable (See "About Us" Spoiler Alert: I am an Introvert). Monica was totally onboard with helping. Monica likes fancy things, and would talk to a wall if there was no one else around (Sorry, M, but you know that it’s true). I knew she could help guide me on what looked good, and she would take care of the small talk at the party. The other key person in our trio (we’ll call her Mrs. H) gets stuff done, also has great taste, and is a walking welcoming committee (as a bonus, it turns out she is the nicest bossiest person too. I mean that in a good way that keeps us on track). I knew I could depend on her to not let me procrastinate, to be super resourceful (she made those little office clip card holders! ), and really great at making people feel welcome. We chose 2 types of drinks, Mimosas (of course) and Mojitos. Then we decided a few flavors would keep it interesting, and make it a little more special. 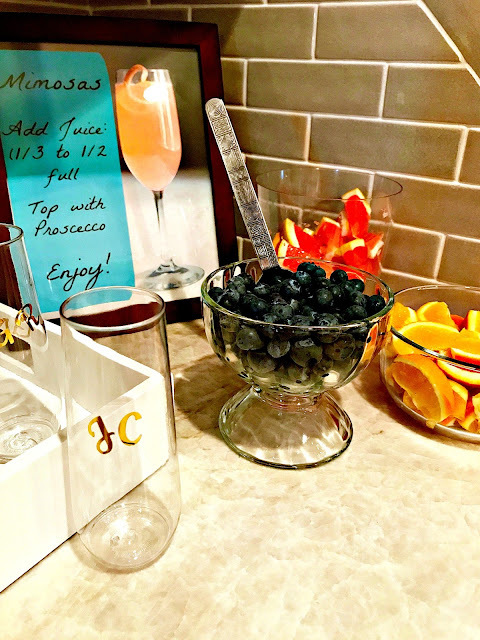 Again, with simplicity being the goal, we opted to keep the flavors the same for both the Mimosas and the Mojitos. - I did throw in a grapefruit version since I am currently loving Ruby Red Grapefruit Mimosas. Why these flavors? Because they come ready made. We used the “Simply” Brand. We wanted a couple of snacks, since it was at 7:00 PM we could keep it light. We bought ready made mini quiches, mini meatballs we could keep warm in a crockpot, veggie tray, pita chips and some awesome already prepared Spinach Artichoke dip from Costco that everyone raved about. We also wanted to stick to finger foods, so we didn’t have to fool with utensils. Mrs. H made some awesome desserts. Honestly, there may have been some Pinterest involved here, since I wasn't actually making them, I can't say for sure. She bought Brownie Bites and melted a Carmel on each sprinkled sea salt on top (OMG, yum and easy). 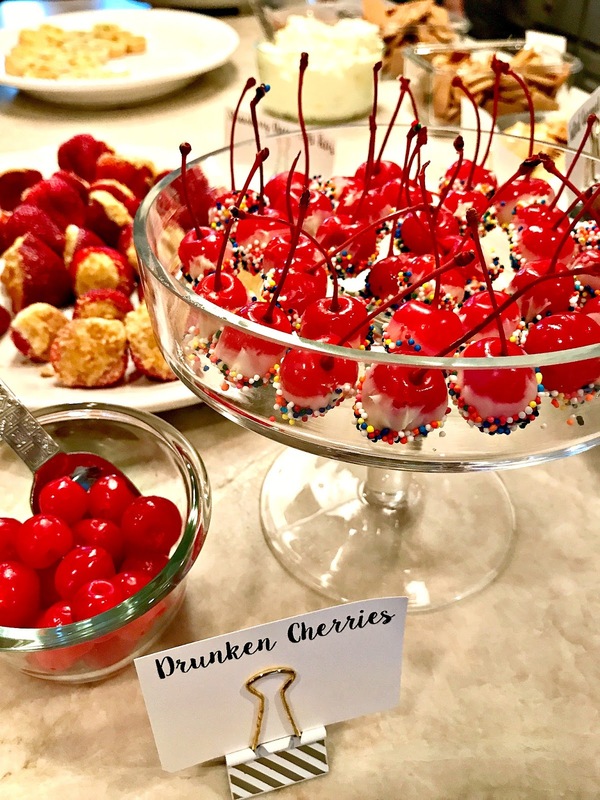 We had some maraschino cherries soaked in vodka, dipped in melted white chocolate and sprinkles (so pretty), some slice and bake cookies, strawberries stuffed with a cheesecake filling, and a key lime dip. We set them all up on our prettiest cake stands and dessert dishes. - Dry Champagne, Prosecco, Cava (can be cheap, but needs to be dry or Brut. We went through about 5). You can also purchase champagne at the grocery, something for cheaper than the liquor store, and ours gives you a 10% discount if you buy 6. Champagne flutes - We bought these amazing, disposable stemless flutes on Amazon. Seriously, these are the bomb. I will buy them again. Put Dip in a fancy dish and set out the pita chips and crackers. 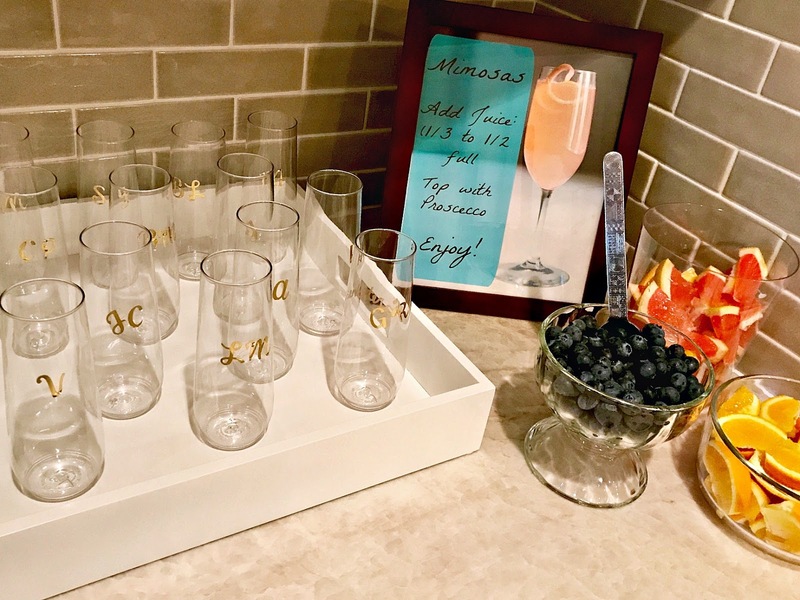 Set out the champagne flutes - there is just something about champagne flutes in mass that look elegant and party ready. Print Directions for making the two drinks and put into a frame. Tip: If you want to make things even easier, you can add your rum to the juices and have everything ready made. Since we went to the grocery store and Costco - I would say an hour and a half. If you are really short on time, you can buy everything at the grocery store. Time to shop on Amazon (I get a little distracted, but if I focus or just click on the links in this post - seconds to 2 minutes tops!). Set up: The three of us did it in under an hour. Including decorating, “cooking”, setting up food and bars. Well done! Such stunning preparations. Classic availability of groceries and drinks has made it easier for us to organize an exhibition next month. Have already hired one of the awesome rental spaces for parties online. Will be an open invitation to all. Snacks, dishes and wines will be prepared by all my friends. Quite excited for the event.